About Magento 2 Rich Snippets via Schema.org Structured Data. 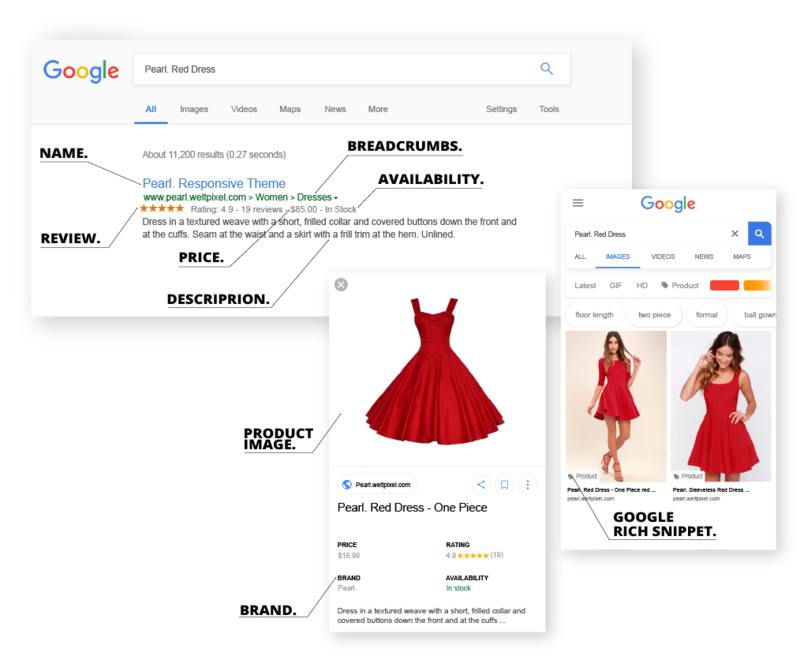 Boost online store SEO, improve usability and attract more customers by adding Rich Snippets for Google Search, Facebook Open Graph, Twitter Cards and Pinterest Rich Pins. Rich Snippets enable users to quickly identify specifics about your products and website. Increases real-estate on the Search Result page and increases Click-Thru-Rate (CTR). Google will discover the structured data as soon as it crawls your site (although it may take some time for the the Rich Snippets to appear in search results). When Google algorithms discover technically correct markup on a page, Google uses a variety of signals to determine when to show Rich Snippets on the search result page. Availability - Indicates that the item is in stock. Description - ability to select between short and long description when adding product details to structured data. Upload Custom Logo - you can upload a custom logo, different than the logo used for your store. 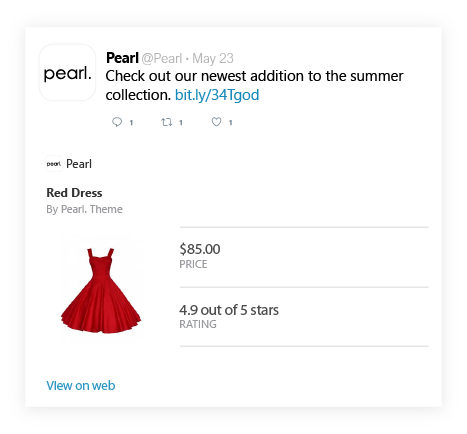 Twitter Cards - showcase your products on Twitter using Image, Long / Short description, Price (with/without tax) and highlight site and tweet creator. With Twitter Cards, you can attach rich photos, videos and media experience to Tweets that drive traffic to your website. By using this extension, users who Tweet links to your content will have a “Card” added to the Tweet that’s visible to all of their followers. The Facebook Open Graph protocol enables products sold on your store to become a rich object in a social graph. 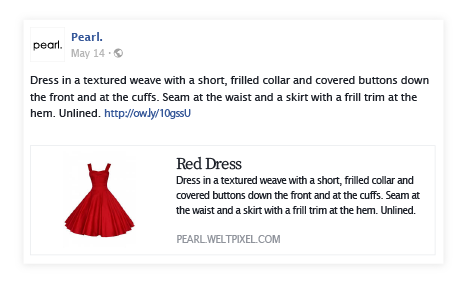 For instance, this is used on Facebook to allow your store product pages to be highlighted in Facebook feeds. Facebook Open Graph - showcase your products on Facebook with rich product information using Image, Long / Short description, Price (with/without tax), and highlight Site name and app Id. Rich Pins are Pins that include extra information right on the Pin itself. Rich Pins show metadata right on the Pin itself, giving Pinners a richer experience and increasing engagement. Information in a Rich Pin is independent of the Pin description, ensuring that important information is always tied to the Pin. There are 6 types of Rich Pins: app, article, movie, place, product and recipe Pins. Rich Pins work by displaying metadata from marked up pages on your website. Once you've applied for Rich Pins, any content on your site with metadata will turn into a Rich Pin when a user saves it. 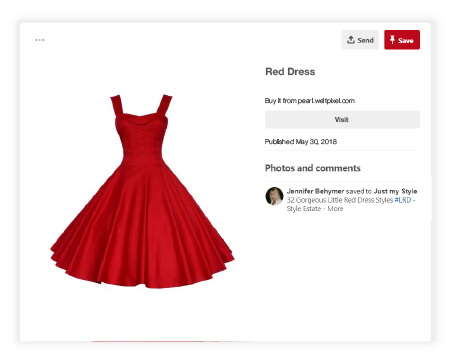 Pinterest Rich Pins - showcase your products on Pinterest with rich product information. Before installing Google Rich Snippets, Twitter Cards, Facebook Open Graph & Pinterest Rich Pins Extension on a Magento2 store please check the extension compatibility. This extension is currently compatible with the following Magento versions 2.0.X. - 2.3.1. It is recommended to install the extension first on a testing server before you install it on a live (production) server. Step 1. Remove extension code under app/code/WeltPixel/GoogleCards before adding the new extension files. The extension may be refactored and old unused files may cause random issues so it's best to only keep the latest version of the files. How to create rich snippets for your Magento store. Enable [ Yes / No ] Activate or deactivate Rich Snippets and all related options. Description Choose between Short description and Long description, option chosen will be added to rich structured data. Price currency - Automatically added to strucutred data from store settings. Availablility - Automatically added to structured data from prodcut inventory. Brand - Select an additional brand that will be added to structured data (Country of manufacture, Shipping, etc..). SKU - Control over the attribute that is used for product SKU, usually it is used the magento default attribute SKU but in special cases a different attribute can be used. GTIN - Control over the attribute that is used for product GTIN code. A 13 digit code is necessary to be added on product details for this partiular attibute in order to be correctly validated. If you do not use a GTIM code, do not select any attribute for this option and it will not show up in your structured data. MPN - Control over the attribute that is used for product MPN code. This code is necessary to be added on product details in order to show up in structured data. If you do not use a MPN code, do not select any attribute for this option and it will not show up in your structured data. Number of reviews - Specify the number of latest reviews to included in structured data. Use Breadcrumb Snippet - Add data related to Breadcrumbs to structured data. A breadcrumb trail on a page indicates the page's position in the site hierarchy. A user can navigate all the way up in the site hierarchy, one level at a time, by starting from the last breadcrumb in the breadcrumb trail. Enable Searchbox [ Yes / No ] - Activate searchbox functionality in Google Search. Enable Rich Snippet for Logo and Corporate [ Yes / No ] - Enable Google Search to show logo in Search results and in the Knowledge Graph. 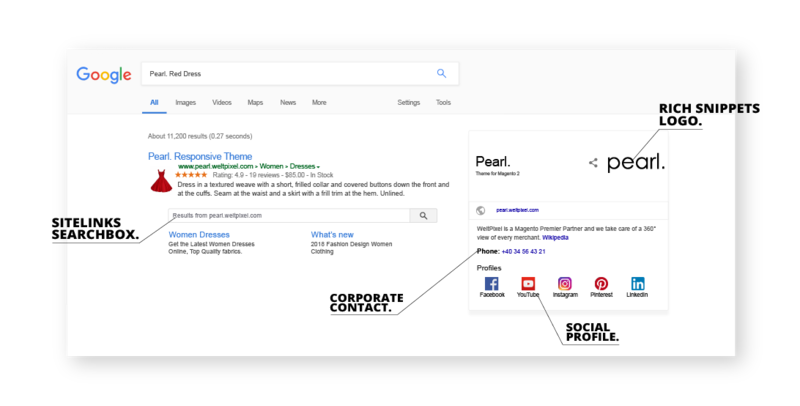 Enable Rich Snippet for Corporate Contact [ Yes / No ] - Enable Google Search to show Corporate contact in Search results and in the Knowledge Graph. Contact Telephone An internationalized version of the phone number, starting with the "+" symbol and country code (+1 in the US and Canada). Examples: "+1-800-555-1212", "+44-2078225951"
Contact Type - Examples: "customer support", "technical support", "billing support", "bill payment", "sales", "reservations", "credit card support", "emergency", "baggage tracking", "roadside assistance", "package tracking"
Contact Option - Details about the phone number. Currently only these are supported: "TollFree" and "HearingImpairedSupported"
Enable Social Profile - Enable Google Search to show up to 10 Social Profiles in Search results and in the Knowledge Graph. Facebook Url - If added, Facebook profile will show in Search results and Knowledge Graph. Twitter Url - If added, Twitter profile will show in Search results and Knowledge Graph. Instagram Url - If added, Instagram profile will show in Search results and Knowledge Graph. Google+ Url - If added, Google+ profile will show in Search results and Knowledge Graph. Youtube Url - If added, Youtube profile will show in Search results and Knowledge Graph. Linkedin Url - If added, Linkedin profile will show in Search results and Knowledge Graph. Pinterest Url - If added, Pinterest profile will show in Search results and Knowledge Graph. Myspace Url - If added, Myspace profile will show in Search results and Knowledge Graph. SoundCloud Url - If added, SoundCloud profile will show in Search results and Knowledge Graph. Tumblr Url - If added, Tumblr profile will show in Search results and Knowledge Graph. Twitter Creator Type Twitter username of the administrator of Magento store or owner of the store. You can use the site username or leave empty. How to setup Schema.org Structured Data. Based on Google policy this data will be shown in the search results. Stores using this data structure will be highly advantaged by search engines, like Google, Yahoo, Bing and other search engines. After you click debug button, then you will get the analysis. Implemented a fix for missing static blocks title. CMS page titles are now correctly shown. Fix for contact Rich Snippet, proper JSON formatting display. Fix for missing breadcrumbs on Product Pages. Adding organization name fallback to store name. Remove ‘Item condition’ attribute group assignment for Pro version. Fixing view_preprocessed file issue for Pro version. Removed magento duplicated product schema if WeltPixel Rich snippets schema is enabled. Upgraded schema and removed error for non existing reviews. Upgraded schema and removed error "The review has no reviewed item specified." Added possibility to select the attribute used for SKU structured data. Added Reviews (Author, message, review name, date, rating). Added Item Condition - New / Damaged / Refurbished / Used. Added Breadcrumbs - website hierarchy structured data. Added Sitelinks Searchbox - expose your search box in Google Search. Added Rich Snippets Logo (Use store logo or upload new logo). Added Corporate Contact - structured data for company contact. Added 10 Social Profiles - display your social profiles in search results. Added GTIN - product GTIN code structured data. Magento default schema removal if WeltPixel rich snippets is enabled. Adding facebook graph warning fixes. Adding fb:app_id meta tag and admin option posiibility as well for fb open graph. Removing magento default schema.org pricing if google cards enabled, wrong price display fix. New admin option: Possibility to select Price Including or Excluding taxes if both prices are displayed. Added New Twitter cards admin options: Summary Card, Summary Card with Large Image. 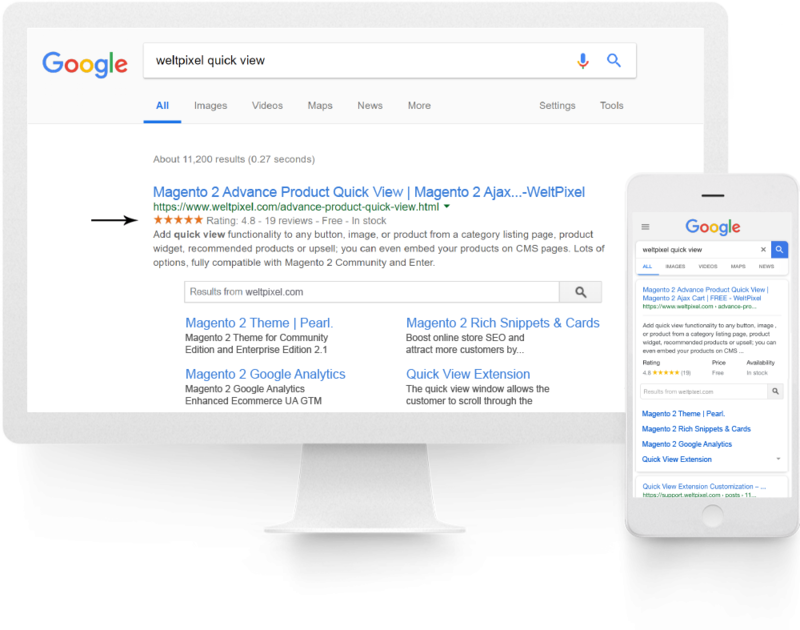 You're reviewing:Magento 2 Rich Snippets (Schema.org Structured Data).